As Conspirare's founder and Artistic Director, Johnson assembles some of today’s finest singers to form a world-class ensemble. Johnson is also music director of the Cincinnati Vocal Arts Ensemble and conductor emeritus of the Victoria Bach Festival. He has served as guest conductor with Austin Symphony, San Antonio Symphony, Oregon Bach Festival, Harvard University and many others in Texas, the U.S. and abroad. Through these activities, as well as Conspirare’s many recordings on the internationally distributed [PIAS]harmonia mundi label, Johnson brings national and international recognition to the Texas musical community. Johnson was Director of Choral Activities at the University of Texas at Austin from 1990-2001 and remains an active educator, teaching workshops and clinics statewide, nationally, and internationally. 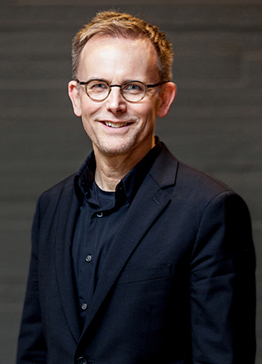 He currently serves as Artist-in-Residence, Professor of Practice at Texas State University School of Music. A composer and arranger, Johnson works with G. Schirmer Publishing on the Craig Hella Johnson Choral Series, featuring specially selected composers as well as some of his own original compositions and arrangements. His music is also published by Alliance Music Publications. Johnson’s pieces are in high demand by choirs across the United States who also commission his work. Johnson’s accomplishments have been recognized with numerous awards and honors. Notably among them, he and Conspirare won a 2014 Grammy® for Best Choral Performance, Chorus America granted him the Michael Korn Founders Award for Development of the Professional Choral Art in 2015, and the Texas State Legislature named him Texas State Musician for 2013. Other honors have included 2008 induction into the Austin Arts Hall of Fame, Chorus America’s 2009 Louis Botto Award for Innovative Action and Entrepreneurial Zeal, and the 2011 Citation of Merit from international professional music fraternity Mu Phi Epsilon. Johnson studied at St. Olaf College, the Juilliard School, and the University of Illinois, and earned his doctorate at Yale University.